The Layla 24 inch vanity presents a sleek and attention-grabbing profile that will make your bathroom "The Room" in your home. A pristine white finish and dazzling blue glass hardware please the eye while the solid wood frame, dovetail joint construction, and soft-close glides and hinges testify to quality craftsmanship. Layla's uncluttered panels allow the beauty of its design and construction to shine through. A matching mirror and linen tower allow you to create a complete design palette. Let Layla bring your bathroom to life. This vanity is a great way to add modern style to your bathroom. With a off-white artificial stone counter and white solid wood base, this product is good-looking and useful. Put a nice touch on your bathroom's look with this vanity set from Art Bathe. Classical in style, the Thompson 31-inch combo boasts a timeless appeal that will enhance the beauty of any bathroom. Tasteful detailing enriches the sophisticated aesthetic that includes the choice of either a Charcoal Glaze or French White finish. A solid wood frame, dovetail construction and Black Bronze hardware speak to the quality craftsmanship of this collection. The combo includes a durable galala beige marble top and oval white vitreous china sink. For a bit of traditional style in your bathroom, choose this beautiful vanity. Its beautiful white quartz counter and off-white solid wood base bring a great new look into your bathroom. With drawer and double-door cabinet, this vanity set is also great to keep items in. Put a nice touch on your bathroom's look with this vanity set from Fresca. 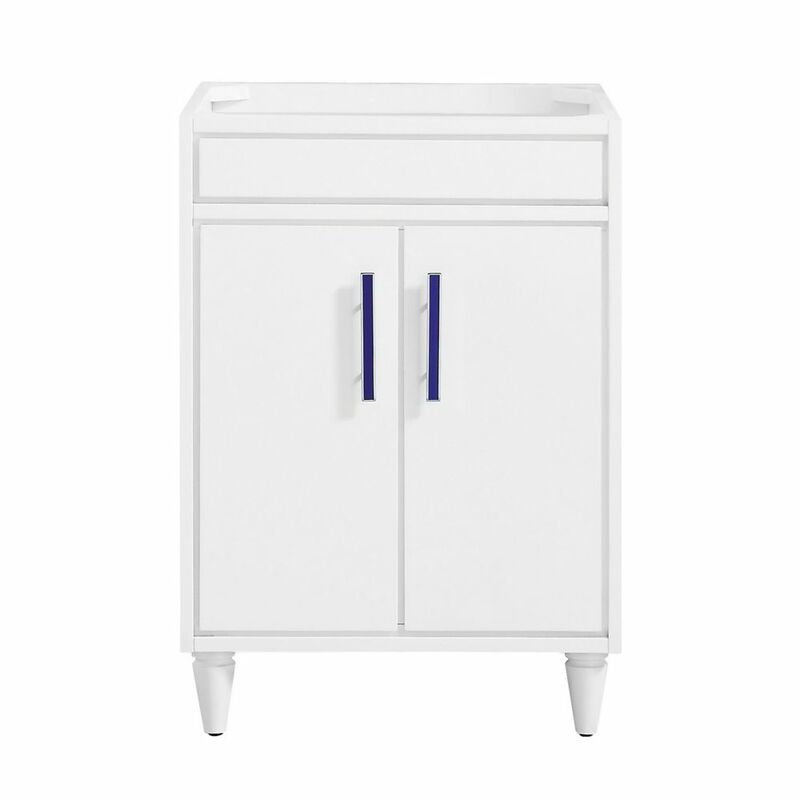 Layla 24 inch Vanity Only in White The Layla 24 inch vanity presents a sleek and attention-grabbing profile that will make your bathroom "The Room" in your home. A pristine white finish and dazzling blue glass hardware please the eye while the solid wood frame, dovetail joint construction, and soft-close glides and hinges testify to quality craftsmanship. Layla's uncluttered panels allow the beauty of its design and construction to shine through. A matching mirror and linen tower allow you to create a complete design palette. Let Layla bring your bathroom to life.